Omar Victor Diop’s Self Portrait Series Project Diaspora #celebratephotography « Adafruit Industries – Makers, hackers, artists, designers and engineers! Identity and discovery–at both the collective and personal levels–are themes in the forefront of Omar Victor Diop’s Project Diaspora. A journey through time, the photographic series delves into and exposes less spoken narratives of the role of Africans out of Africa. With this body of work, Diop challenges us to rethink our own ideas of history and gives answer to his ongoing, internal dialogue of who he is as artist and person. Starting his research during a four month residency in Màlaga, Spain, where he was immersed in the reality of being a stranger, Diop has focused this first installment on Europe during the 15th through 19th centuries. Inspired by the many baroque artworks created during this time, he considers this period as an awakening of an intense (and previously nonexistent) era of interaction between Africa and the rest of the world. Using portraits of notable Africans in European history as his inspiration, Diop pits their life-journeys and legacies with those of his own, and further defining his intrigue of the singular destinies of travellers and those in alien environments. sport, football in particular, to show the duality of living a life of glory and recognition, while facing the challenges of being “other”. 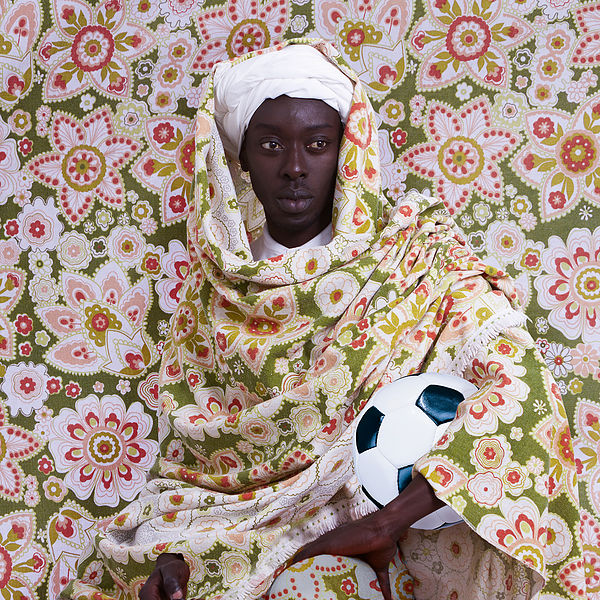 Read more about Project Diaspora, see more from Omar Victor Diop and go actually look at the series in Atlanta before the exhibition closes 8/18!